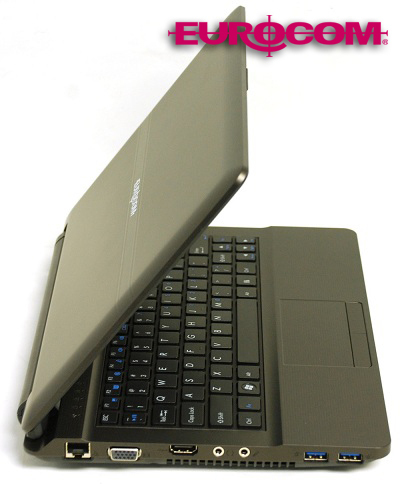 The 1 TB, 2.5 inch HDD is the world's first SATA III (6 Gb/s) hard disk drive , and Eurocom (www.Eurocom.com) is the first to offer it in such a small form factor netbook. Adding the advanced storage technology of the Hitachi Travel Start 5K1000 to the EUROCOM Monster allows Eurocom to meet user’s demand for super large storage capacity and high performance . “The EUROCOM Monster is like we stuffed a High Performance Notebook into a Netbook form factor, it always had the performance and now it can be customized with a massive amount of high capacity 1 TB, high speed 6 Gb/s SATA storage, in other words, the Monster lives inside of this beast!” Mark Bialic, Eurocom President. 1 terabyte, 6Gb/s SATA mobile hard drives are perfect for use within the EUROCOM Monster where user’s demand increasingly large storage capacity and blazing speed. “The Monster 1.0 features an amazing form factor, great built quality, superb keyboard, reasonable price tag, and .. yeah, Monster like performance, which you really don't expect to see in such small laptop” explains Nadav Appel, Eurocom Customer. The EUROCOM Monster is the perfect system for Students because of its long battery life, of up to 410 minutes, coupled with its high level of performance. The small size of the Monster allows students to fit into nearly any school bag, at just under 4 lbs and 1.5 inches thick at its biggest point it is extremely portable. The Monster comes with a long list of connectivity ports to allow students to connect their Monster to nearly any external device. Now with up to 1TB of super fast SATA III storage the Monster has the high capacity and fast data transfer speeds students need. Now with the Eurocom Education Program, students can get up to 10% of their Monster plus a free 750GB Hybrid Storage Drive and 8 GB DDR3-1600 memory with the Refer a Friend Promotion. Some of the features that make the Monster the perfect fit for students also apply to professionals of all kinds. The super portable design allows users to have the power held within the Monster wherever they go, with the battery life to ensure the Monster doesn’t need to be tethered to a power outlet. The EUROCOM Monster has the computing power and capability to ensure professionals from all arenas can get the job done fast, wherever and whenever they choose. The Monster even supports multiple operating systems including, but not limited to Linux, Windows 7, Windows 8 and Microsoft Server 2008. “In my case I have chosen the impressive Intel Core i7 3820QM Processor with 4 cores, 8 threads and 8 MB of L3 Cache with 16 GB DDR3-1600 RAM and a 240 GB Intel 520 Series SSD. I can run plenty of VMs at the same time: w2k3 r2 sp2, w2k8 r2, CentOS 6.....with no problem. The performance with MatLab and others engineering tools is amazing. Never seen that in a 11.6 inch portable” Koldo Valle Garcia (@kanelus), Computer Science and Communications Services, Elecnor. Like all Eurocom notebooks, the Monster is a highly customizable, configurable and upgradeable high performance system. During the purchase process customers can configure the Monster with processors ranging from Intel Core i5-3210M to Intel Core i7-3920XM Processor Extreme Edition. Memory can be configured from 4GB of DDR3-1600 to 16GB DDR3-1600. Eurocom offers a variety of storage options including SSDs from Crucial RealSSD C400, Intel SSD 520 series, Hard Drives from Hitachi Travestar 5K1000, Western Digital and Hybrid Drives from Seagate. Even wireless technology, keyboards, displays, warranties and TV tuner cards can be customized, along with Operating Systems. At Eurocom customers get exactly what they want and the in the future have the ability to upgrade their system because Eurocom continues to offer upgrade service for past models. At the core of the Monster 1.0, users have an NVIDIA GeForce GT 650M to do their bidding, with 2GB of video memory, 384 cores, with the graphics clock running at 850 MHz this new graphics powerhouse is the ultimate mobile gaming and professional machine, all in a super small and portable form factor. With Optimus support, the EUROCOM Monster can run for up to 410 minutes on one charge. Eurocom engineers have been testing and benchmarking the EUROCOM Monster 1.0 with various configurations and testing suites with unbelievable results. Eurocom does benchmark testing to ensure all of the published configurations function optimally and customers get the high performance hardware that they expect. Below is a selection of the testing that has been done.